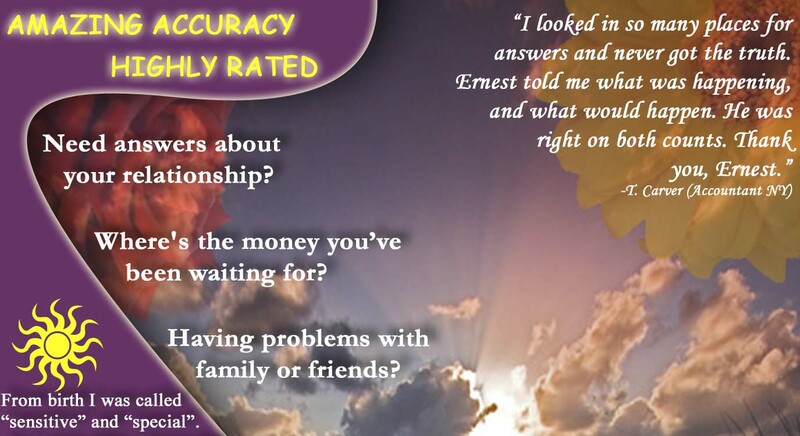 ONE OF KEEN'S BEST PSYCHICS since 2004, Ernest is an INDEPENDENTLY CERTIFIED psychic (BPI, SCPI) who has read for tens of thousands of people JUST LIKE YOU. He sees anyone's thoughts, feelings, intentions, dates, outcomes! Do you need to get accurate answers about how someone is feeling about you, and what they are going to do next? Do you need to know if you are predestined to be with a particular individual? Do you need to heal a relationship that is crumbling as you read this? ERNEST CAN FIX IT. He can tell you whether the person you are with is a Soulmate. He can tell you what is coming for your relationship tomorrow, next week, next month or next year. And if it is possible to fix it, he will walk you step-by-step through how you can save it! *I have been doing readings/healing (psychic)/coaching for almost 25 years. 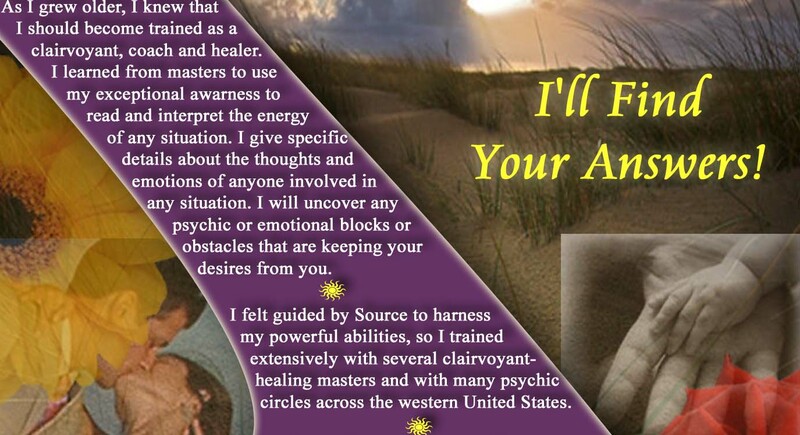 *I have studied with dozens of unaffiliated master psychics and healers from 26 different countries. *I have been awarded a doctor's certificate in Metaphysical Studies. *I have studied christian mysticism with ascetic Jesuit scholars. *I have studied Mahayana Buddhism with exiled Tibetan Lamas. *I have studied with Iroquois and Kickapoo Shaman. 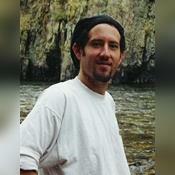 *I have studied Zen Buddhism (1 Year) with Zen masters at Tassajara Mountain Center. *I have studied the ancient Vedas with Vedantic Swamis from all over India. *I am a licensed private investigator (two states). From a young age I knew something was different about me. People's thoughts and feelings were EXCEPTIONALLY EASY TO UNDERSTAND. I had my first full-blown premonition at age 9 (death of a friend that was later confirmed). For the following 10 years, I read and counseled for relatives, friends and acquaintances, honing my abilities and learning the skills needed to give a truly neutral, insightful and most importantly ACCURATE readings. Once I hit adulthood, I studied psychic theory and practice fervently and have honed my skills to become one of the psychics that OTHER psychics call for answers. My drive to understand my gift has taken me all over the world. I have uncovered the most valuable psychic tools from all over the world and will use my unique assembly of skills to help you SOLVE ALL YOUR PROBLEMS. Your needs are real and WE WILL FULFILL THEM. I bring a unique, compassionate and very relaxed energy to each and every reading. You will be LOVED, ACCEPTED AND UNDERSTOOD no matter what your situation is. I have heard it all and I unconditionally love and accept every client the Universe brings! I provide as much information as possible in the shortest amount of time and do my best to answer every question you have. Just remember that the more specific your question, the more specific the answers can be. 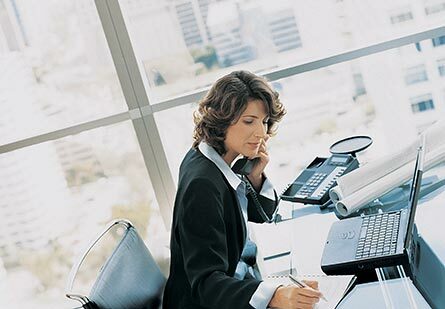 Clients who have called and spoken to me can expect email support on daily basis. I really go out of my way to get back to everyone within 24-48 hours, but sometimes it can take a bit longer. YOU'RE NOT ALONE with what you are going through. I WILL HELP. No matter how bad you think it is, I AM HERE FOR YOU. Using my SPECIAL PSYCHIC GIFTS, I will guide you along the path that leads to your truest happiness. I need only the smallest bit of information to get started so be prepared with your questions when you call or chat. Together we will get that relationship where it needs to be or get a new one started. We'll get your career where you always wanted it to be, too. YOU AREN'T MEANT TO STRUGGLE AND SUFFER. I will make it better for you! Ernest deserves a 5 stars every time! I like how this psychic reads. He knows the underlining issue and how to fix it. Wish I could of been able to add more money. Will be calling back soon. From a very young age, it was apparent to my family that I was gifted. As I grew older, those gifts got more and more pronounced. I learned that I had a special skill that would enable me to help people who were in dire need of answers. I trained in several psychic/metaphysical schools and with several Master Psychics and teachers all over the world, to hone my skills and learn the nuance needed to give an exceptional and accurate reading. Over my 20 + years of doing readings professionally, I've learned just how important it is to translate what the Energy is saying, so that YOU can understand what's going on in your situation. Here is your chance to talk to one of the best male readers in the world and get an accurate, trustworthy, honest and compassionate answer. I will pull no punches in my reading so please understand I'm only reading the energy that's there. You Deserve To Know The Truth About Why And How To Fix It. some of the top psychics in the world. Clairvoyant Ernest Is Here For YOU. Send Me An Email Or Schedule An Appointment! Dream Interpretation - Unlock Your Dreams! **I'm not a doctor or a licensed financial planner and no advice is intended to replace the advice given by a licensed professional. 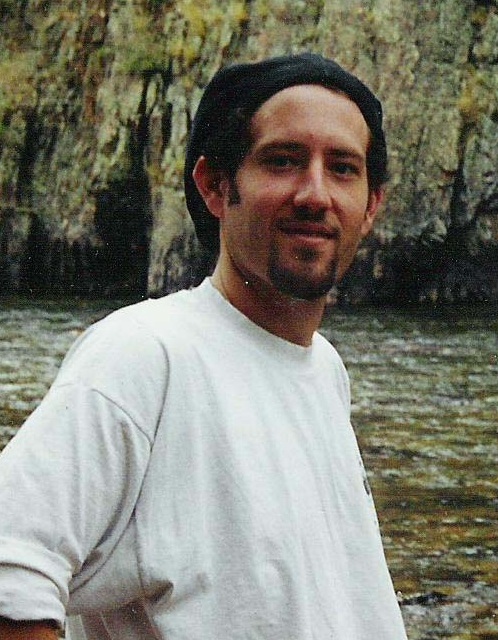 CLAIRVOYANT ERNEST has been a user of Keen since 2004. 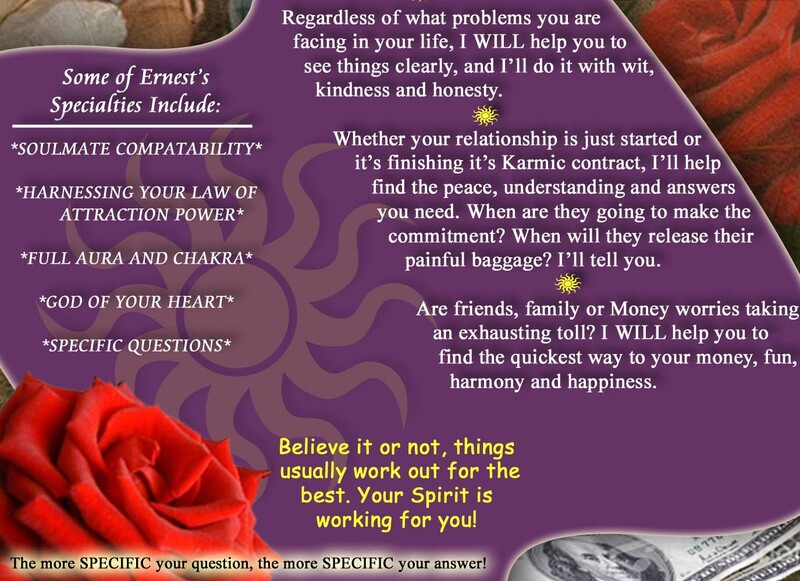 Getting Life Questions advice from CLAIRVOYANT ERNEST through www.keen.com is safe, secure and confidential.